Disney on your Doorstep is just a charming, relaxing, and feel at home, kind of home... you know when you're sitting by the pool and the kids are having a ball, that you've picked the right spot.... our, wonderful 5 bedroom, 4 bathroom vacation home with private pool, spa & Game room in the exclusive neighborhood of Indian Creek. Our neighborhood boasts community, sidewalks, play areas, tennis courts, and a jogging/walking track circuit. You will enjoy the open spacious floor plan in our home, and the friendliness of our neighborhood. We are pet friendly and we welcome pets in our home. We also have a local pet sitters who will come in and take care of your pets during your stay to make your pets vacation as much fun as your families. With a private, south facing pool and built in spa, our spacious, beautifully decorated home is furnished with quality in mind. We offer high quality home for a truly affordable vacation. We have added a wide range of personal touches to provide you with everything you could possibly need for a completely relaxing, vacation. New AC and Furnace inside and out!!! Stay cool this summer with a great new system!! New Gas BBQ Grill added as well!! Ceiling fans in all the rooms!! Wheel Chair accessible shower and ramps at the front door and to the pool area. There are New Flat Screen Cable TV 's in most of the bedrooms. Fully equipped kitchen plenty of plates, glasses and supplies! Private pool with built in spa oversized pool deck 5 sun loungers and 2 tables and chairs all in comfortable palm casual furniture. All linens and towels are provided with our home again we have more towels and linens than your average home. We have tasteful Disney décor throughout the home just to keep the Magic with you. You wont find a more relaxed and comfy home than this home! Close to everything and so quiet! Using a shortcut to Disney, Disney on your Doorstep is just 4 miles away from all of the Magic of Disney - This will save you a lot of time to enjoy your vacation instead spending it in traffic. We're so close, you can take and afternoon break back at the home and enjoy a nap or a dip in the pool, then return to the parks in the evenings to watch the fireworks. toilet, tub, shower, Large Garden Tub, and walk in shower wheel chair accessable! There are ramps at the front door and back door and the shower you can roll a wheel chair in. The house was perfect for our stay!!! Thank you for sharing this great home with us!! We will be back!! Super clean, well laid out floor plan, perfect location! We stayed for 3 weeks late February into March. We're Canadians escaping the cold. The house was very clean on arrival, nice floor plan, and well decorated. Pool was great during the warm weather and a drink in the hot tub at the end of the night was a perfect way to end each day. The home had everything we required, we ate the majority of our meals there, lots of bbqing! Great location near all the parks, shopping, restaurants, groceries, etc. Hope to be back in Florida again next year and will definitely check to see if this home is available again. Thanks for all! Great for families with kids and pets! Our whole family had a great time!! We were SO close to Disney which made life easier to get to the park early before the crowds. The pool and hot tub were excellent and they were super accommodating for pets. We would definitely stay here again if we come back. Staying in this quiet neighborhood with so much room and a GREAT pool made our trip to Orlando both fun and relaxing. The location was perfect since we were visiting many other places in addition to "the parks" and were able to easily access each of our destinations with as little time as possible on I-4. The house itself had more room than we needed, and the convenience of our own kitchen (well stocked) and laundry room was an added plus. It was also fun to have the game room in the garage and of course the pool! 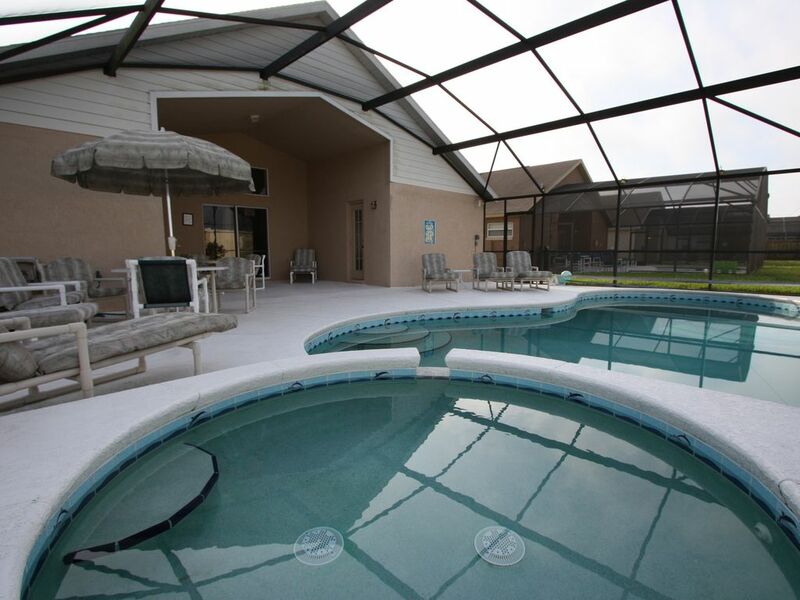 In choosing this home, we were careful to read the reviews of many of the hundreds of rental houses in Kissimmee and often saw folks disappointed that the pools were either freezing cold or they were charged additional fees to heat them to luke warm temps. The pool at this house was already at the optimal temp when we arrived, and it didn't take long for the hot tub to get nice and hot once the timer was turned on. Having this added bonus at the house was certainly the main reason we chose this rental and we weren't disappointed. Karen was so easy to work with and was only a text away if we needed anything. We can't recommend this house highly enough! With so many choices in Orlando, that basically look to be the same, this house stands out above the rest. The​ villa was great, however having been advertised as suitable for a wheelchair we were disappointed that there were no assistance bars in any of the bathrooms or a seat for the shower. 200.00 Cleaning deposit is required along with 49.00 damage protection insurance or there is a refundable Cleaning/Damage deposit of 400.00 with each booking Holidays may require larger damage deposits. Holiday Rates are 185.00 per night plus taxes for Thanksgiving, Christmas, New Years, Easter.